The Mazet has two bathrooms: one on the ground floor and one upstairs. They are both equipped with shower and toilet. The Mazet has air conditioning. The car is parked in the garden. Bed linen and towels are provided. Thanks Rachel for making our stay in Uzes such a memorable experience. The house is lovey, rustic and very traditional, clean and supplied with all equipment necessary for a great holiday. The garden is absolutely beautiful, and the patio area is perfect for outdoor dining. Rachel was close by if we needed any assistance, but gave us total respect and privacy. 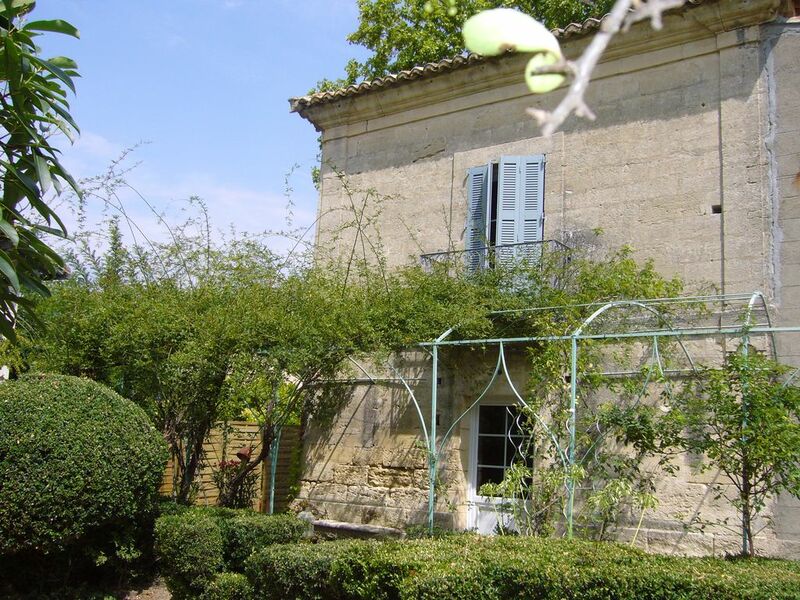 The house is 10 minutes walk into the beautiful, romantic town of Uzes, which has many bars, restaurants, municipal pool, great shops and a lovey market in the main square. We enjoyed out stay in Uzes. The house was very comfortable. Rachel was very welcoming and a lovely host. It was very local to our planned activities and Uzes is small but lovely. We were warmly welcomed by the owner, Rachael to her cute little mazet - it was comfortable and had everything we needed for our stay. Rachael was a wealth of information on places to visit and restaurants to eat at and left us discreetly to our own resources most of the time. The mazet is perfectly located so close to the town of Uzés, a 10 minute stroll or 4 minute drive. A lovely holiday! The cottage was private with everything we needed for a very comfortable stay. Rachel the owner was helpful and friendly without being intrusive. Uzes itself was a great place - we were there for the local 'bull running' festival (very exciting!). It had a great market, and lovely restaurants. The surrounding area was beautiful with vineyards and small fortified hilltop towns. A great place to stay. We spent a magnificent week this April at Rachel's mazet in Uzès. Rachel was helpful from the very beginning, giving us clear directions to her home, in plenty of time. Upon our arrival she treated us as friends, while also giving us total privacy. She made many suggestions for places to visit, both in Uzès and farther away, that made each day unique. Uzès is a beautiful town and for us each trip into town brought something new. It was just a short walk into the center from the house, so fresh bread or a nice meal was easily accessed. The house itself was perfect for our family of four. Inside it was comfortable and had everything we needed. Outside we enjoyed both relaxing in the blooming garden and dining on the patio. Our kids loved the pets next door, and are still talking about the turtles. On our last morning they were invited to pick cherries on Rachel's tree which made lunch on our drive home exceptionally delicious. Thank you Rachel for your kindness and for making our vacation so special! We hope to return soon. Rachel's Mazet is characterful, comfortable and clean. It is set in a lovely garden full of flowers in which to relax after a day in the town (10 minutes walk) or further afield (good bus service to Nimes or Avignon if you do not have a car). Rachel met us when we arrived and took us shopping; she was very kind but unobtrusive. If we wanted anything she was there to help. We did not bother to eat out because there is a good traiteur nearby in the Passage Marchand (near the main car park) which offers ready-cooked meals to take away. Highly recommended! Uzès is a beautiful town with the famous "Place aux Herbes" and its market. Typical landscape ("garrigue), river Gardon, Cévennes, Camargue. Taxes de séjour (0,88 euro par personne de plus de 18 ans et par nuitée). Draps, serviettes et torchons fournis.